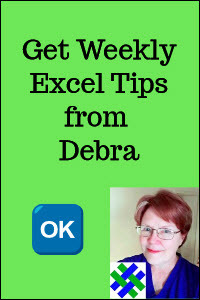 How to do an Excel lookup with multiple criteria in columns, with the INDEX and MATCH functions. Get the sample file, then watch the step-by-step video, or follow the written instructions. This video shows how the INDEX and MATCH functions work together, with one criterion. Then, the formula is changed, to work with multiple criteria. To follow along with the video, download the sample file. There are written instructions too, in the next section. VLOOKUP won't work here, so we'll use the INDEX and MATCH functions together, to get the results that we need. To do this complex lookup with multiple criteria, we'll use the INDEX and MATCH functions. 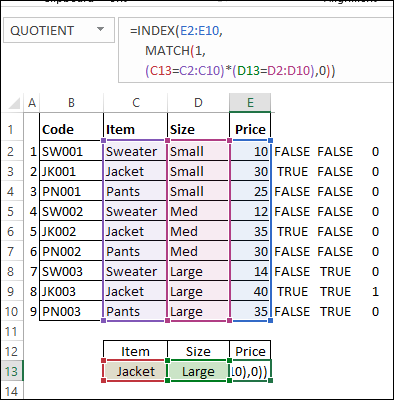 The MATCH function can find the location of an item in a list. 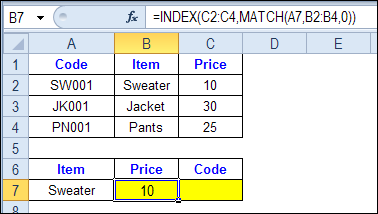 Before using INDEX and MATCH with multiple criteria, let's see how they work together in a simpler formuls. 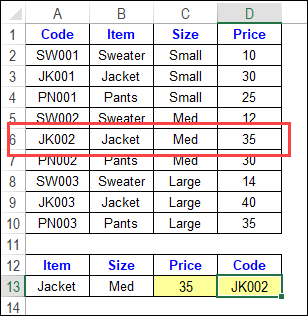 In this lookup formula, we need to find “Sweater” in a column B of a price list, and get its price from column C.
The item name that we need a price for is entered in cell A7 – Sweater. the MATCH function can find “Sweater” in the range B2:B4. The result is 1, because “Sweater” is in the first row of that range. the INDEX function can tell you that in the range C2:C4, the first row contains the value 10. In the previous example, the match was based on one criterion -- the Item name. For the next lookup, there are 2 criteria -- Item name and product Code. In the screen shot below, each item is listed 3 times in the pricing lookup table. To get the right price, you’ll need to specify both the item name and the size. We want to find the price for a large jacket. 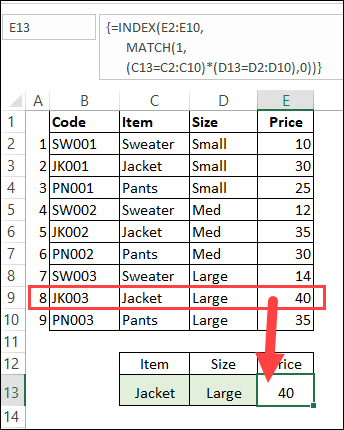 In the lookup formula, we need the MATCH function to check both the Item and Size columns. 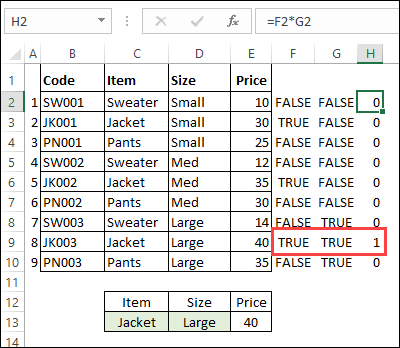 To show how that will work, I'll add temporary columns on the worksheet, to check the item and size columns -- is the item a Jacket, and is the Size a Large? Only the 8th row in our list of items has a 1, because both values are TRUE in that row. We could use a MATCH formula to find the position of a 1 in column G, in the screen shot above. 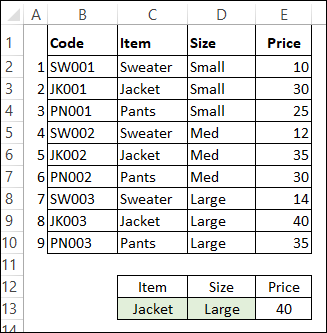 The 8th row of data (worksheet row 9), has the 1, and that row will give us the correct price for a large jacket. But, instead of adding extra columns to the worksheet, we will use an array-entered INDEX and MATCH formula to do all the work. *Press Ctrl + Shift + Enter, instead of just pressing the Enter key. That will automatically add curly brackets around the formula. prices are in cells E2:E10, and the INDEX function will return a value from that range. size criterion is in cell D13. 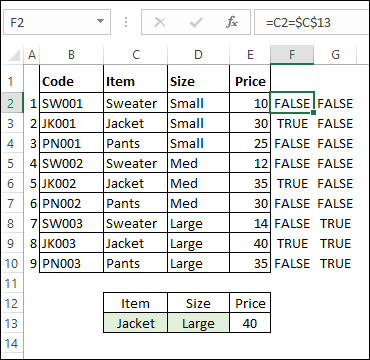 The formula checks for the selected item name in $C$2:$C$10, and the selected size in $D$2:$D$10. The TRUE and FALSE results are multiplied, to return zeros and ones. Press F9, to see the result. 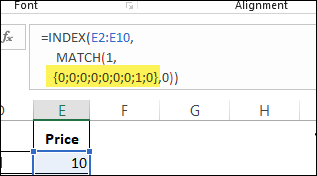 The MATCH function looks for the 1 in the array of results, so in our formula, it returns 8. Then, press the ESC key, to exit the function without saving the calculations.